A lot of people have asked us to name our favorite national park after visiting all of them--a very difficult thing to do as they are all so unique and wonderful in their own way. 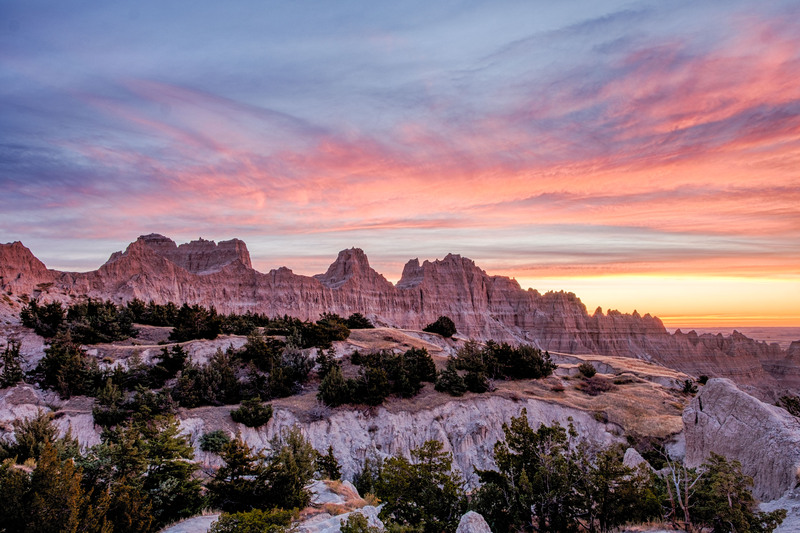 It is much easier to select parks that we really want to return to and explore and learn more about... Badlands National Park in central South Dakota is definitely one of those places. There are many reasons that this park is among the shiniest gems of the year. 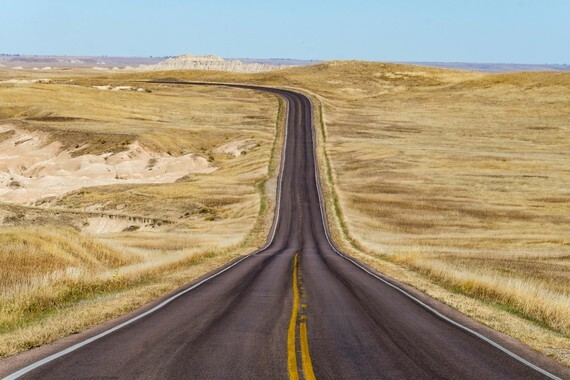 The vastness of prairie grassland that symbolizes the American heartland is striking on its own, then seemingly out of nowhere the Earth opens wide to reveal colorful curved formations--spires, canyons, buttes, fins--that extend as far as the eye can see. The weathered badlands are every bit as spectacular as the Grand Canyon is; it too looks a bit like the inside of a cave that has been turned inside out and warmed by the sun. 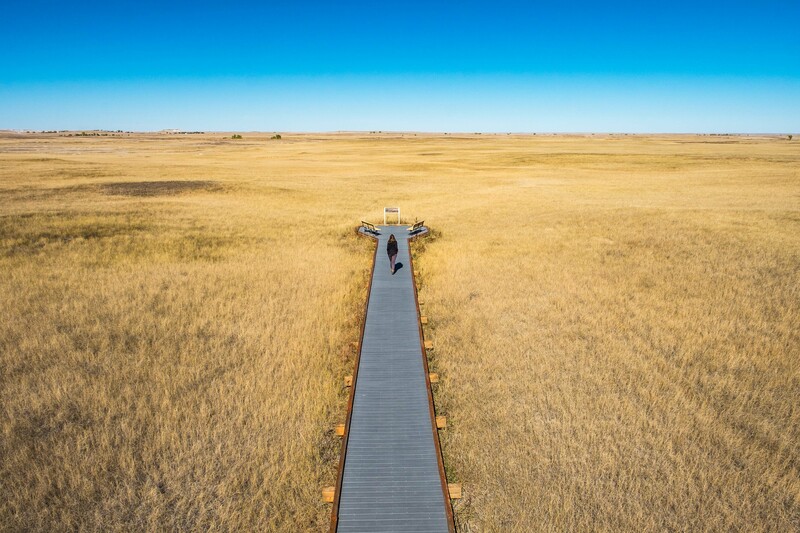 This park is a bit like a foreign country in the sense that it has relics from an ancient past--tens of millions of years old fossils that are continuously exposed when intense Great Plains winds decide it's time to unearth them. It's an adventure park with endless unbeaten paths to explore. Between dark night skies, intricate landscapes, prairie wildlife, and grand formations, photographers could shoot forever and never fail to find something otherworldly to fix their lenses on. American Indians from the Lakota Nation teach park visitors about their cultural heritage in the south Stronghold District of the park which they co-manage with the National Park Service, passing along stories from their ancestors who have lived in the area as far back as 11,000 years. 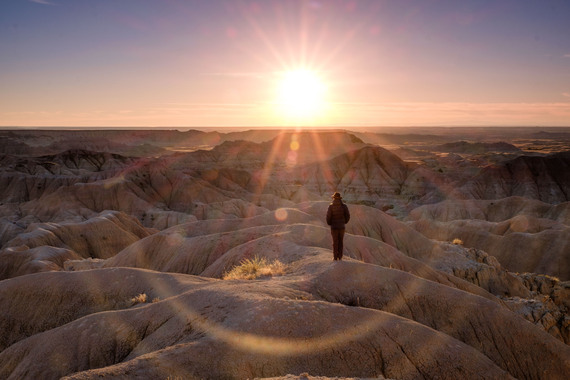 The park is not even 40 years old, but the place is as old as time--entering the badlands opens a doorway to forever. For this article we've focused in on the aspects of this park that made it go down this year as one of those we are dying to return to, and one of the biggest surprises of the year. 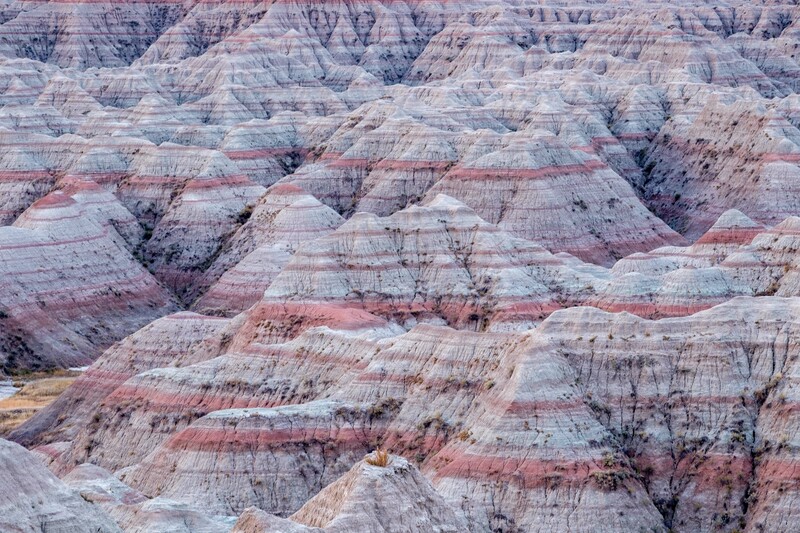 Badlands National Park is the largest mixed-prairie grassland in the United States. There are 60 different kinds of grasses that intertwine 410 other individual plant species to create a complex ecosystem that provides habitat, food sources, and water supply to prairie animals, insects, and birdlife. Wildlife returns the favor to the grasslands. For example, bison are natural planters. With every breath of wind, their fur catches seeds from grasses and spreads them across the landscape. Meanwhile, prairie dogs stir up the soil enabling the grasses to grow. While the system is perfect in its composition, the prairie, which once covered half of the continent, has dwindled to only 2% due to urban growth, farming, and subsequent habitat loss. The moral of this story is to not cast aside grasslands as "wastelands"--they are increasingly rare and vital for the wilderness ecosystems in America. And they are beautiful to look at and wander through! Badlands National Park was named after its badland formations comprised of scrolling hills, canyons, buttes, fins, and pinnacles made of large deposits of sedimentary rock that have eroded over time. They continue to erode each year at a rate of 1 inch which, according to geologists, is faster than usual. Each time the swift winds blow, different eras of time are revealed by rich bands of color that stripe across rock faces, proving that Earth is an always evolving and dynamic system. The largest badland feature in the park is known as "the Wall," a 60-mile stretch of tens-of-millions-years-old rock that acts as a barrier between the upper and lower prairies. Getting up close to the Wall is possible in the North Unit from the Notch and Window trails--both of which offer panoramic views of the badlands and the prairie grasslands that lay atop of them like a golden tablecloth. If you are driving the course of Badlands Loop Road, you can't miss it! Badlands has one of the most concentrated mammal fossil beds in the world, where preserved signs of ancient life are consistently unearthed by the forces of nature. It is especially rich in fossils from the Oligocene Epoch era, 30-33 million years ago. During that time, prehistoric land mammals such as a three-toed horse, a saber-toothed cat, and a dog-sized camel (all extinct) roamed the land; as various species of aquatic animals including snails and sea turtles floated with the seas. 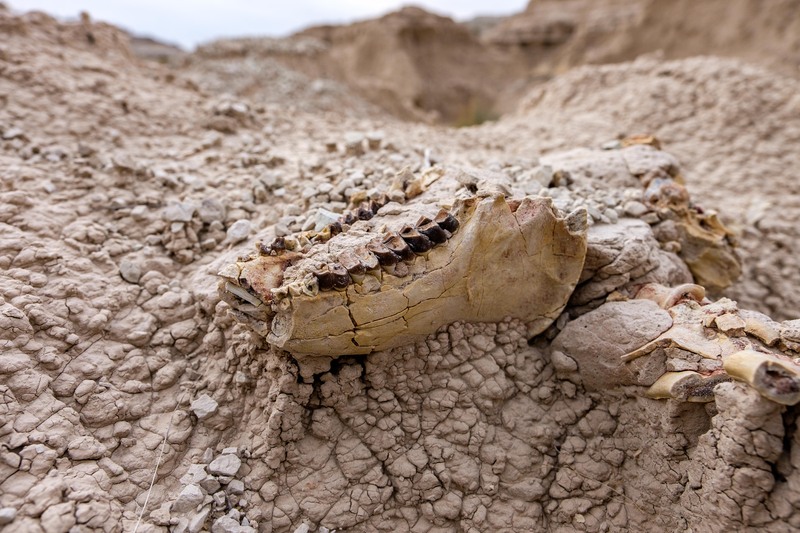 Cedar Pass is one of the areas said to be the most revealing for fossil finders in the park, and true enough, we found the fossilized remains of Oriodont jaws while exploring there. We became fossil finders! And you can become one too. Start with a 30-minute ranger fossil talk or 60-minute guided walk to familiarize yourself with finds in the area; and after that, head out on your own to explore. The Fossil Exhibit Trail off the Loop Road is a good place to start. After that, try out Cedar Pass. If you see something cool, don't touch it, and certainly don't take it. Instead, snap a photo and show a park ranger who can help you identify your find. It might seem as though you are alone on the Badlands landscape but there is wildlife everywhere. When you step into the vast open space and listen to insects chattering from inside the grasslands, you will start to see a wilderness of wildlife open up to you. The largest mammal in the park is the American bison--the iconic symbol of American wildlife as is denoted on the National Park Service insignia. Sharing the prairie landscape are several species of ungulates (hoofed animals) including pronghorn antelope, bighorn sheep, and mountain goats; and trotting across the grasslands looking for prey are golden-colored coyotes which would be better camouflaged if they weren't always on the go. 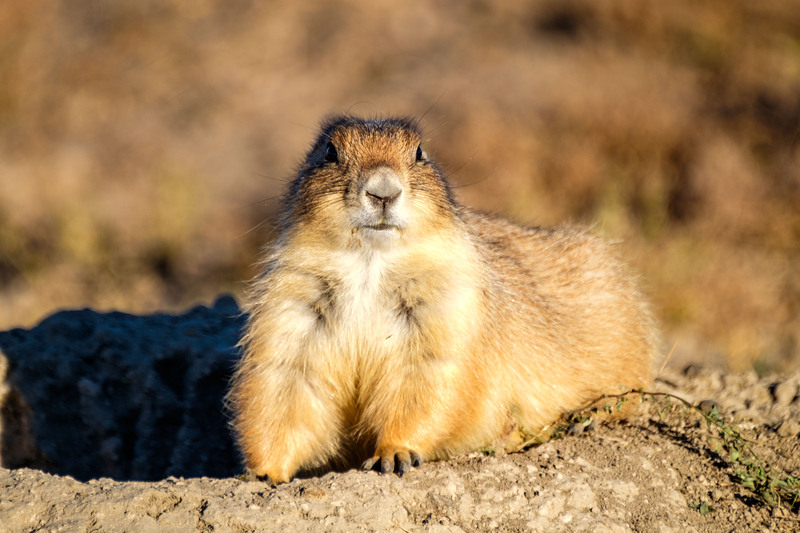 In prairie dog "towns," black-tailed prairie dogs in large numbers are constantly popping out of their holes, alerting pals when outsiders are coming. Overhead, birdlife watches over the landscape--magpie, hawks, bald and golden eagles, peregrine falcons, and as many as 211 other bird species have been identified as locals and/or travelers through the national park. One species that is not so watchable is one of the world's rarest animals, the black-footed ferret, the most endangered of all land mammals in North America. They became all but extinct in the late 1970s when prairie dog colonies (their main food source) were wiped out due to farming. Through reintroduction, their populations are starting to increase. They are nocturnal though so a sighting is very uncommon, but if you are out at night looking, keep your eyes peeled for unusual green eye shine. Windows down, music up, warm wind blowing across the grasslands... the driving roads in and around Badlands National Park are what road trip adventures are made of! 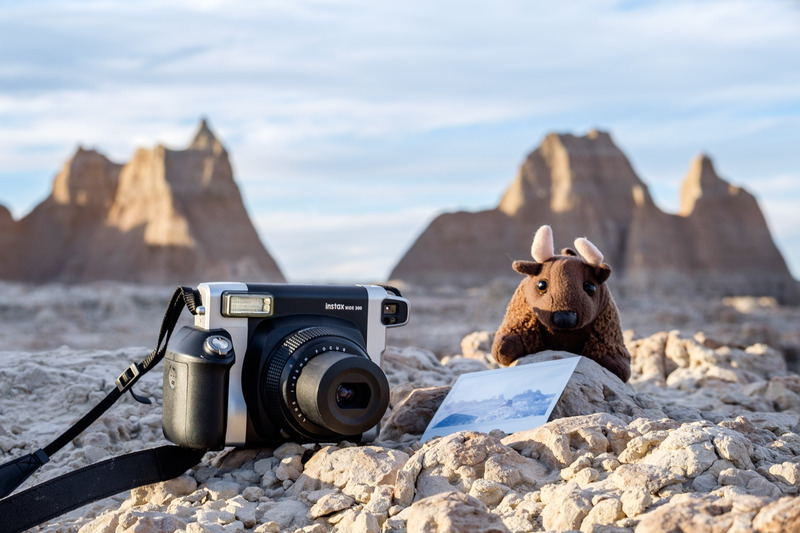 Badlands Loop Road is the main thoroughfare in the park offering plenty of opportunities to take epic photographs that capture the feel of any great American road trip, while providing access to visitor centers, hiking areas, and nearly 30 overlooks that peer onto the badlands. 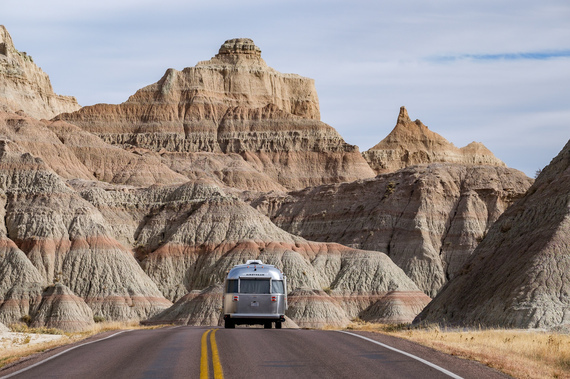 Along Sage Creek Rim Road, you are in for a little more of a rugged ride en route to areas that have denser wildlife habitats; areas heavily populated with bighorn sheep and bison, as well as to Robert's Prairie Dog Town, the most populous "town" in the park. 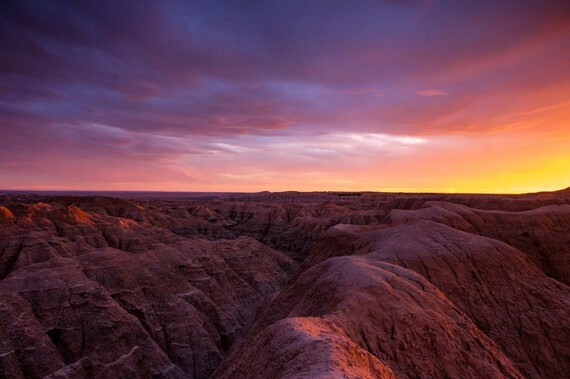 South Dakota is filled to the brim with must-see places in the United States. 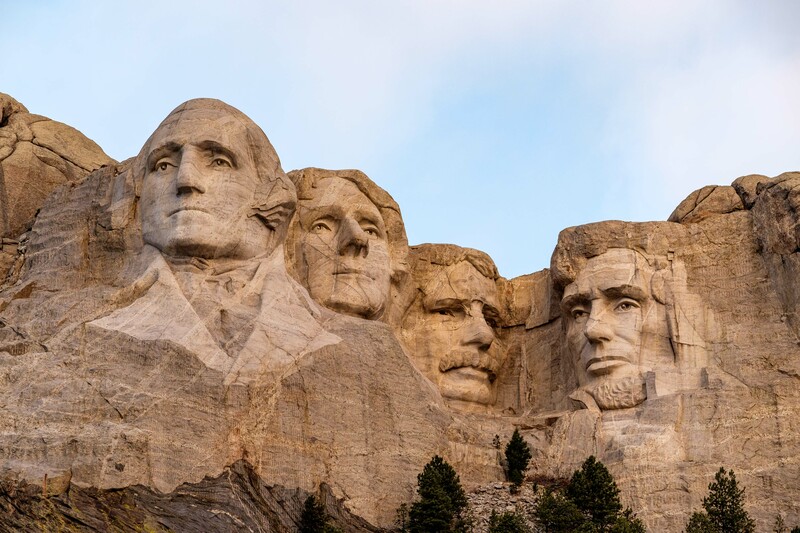 The most popular are dubbed The Great 8: Deadwood, Crazy Horse Memorial, Jewel Cave National Monument, Custer State Park, Mount Rushmore National Memorial, the Missouri River National Recreational River, Wind Cave National Park, and of course, Badlands National Park. Also nearby is the country's most famous drug store--Wall Drug--where one can stock up on pranks, games, toys, treats, history, and American kitsch. If you are doing the road trip thing and have some time to burn, you might also consider hopping over the state line to the west to visit Devil's Tower National Monument in Wyoming. Badland formations are each incredibly unique and are brilliant to photograph from near or far. To step back you can get a real sense of the geology that renders each formation completely distinct from others that they rub shoulders with across the landscape. From the macro vantage point, the larger picture of mixed-grasses, uniquely carved rock formations, big sky, soft colors, earthly textures and interesting weather systems work together to create a scene that is totally unique to the American heartland. Up close, formations made of compressed sand, clay and shale beds formed from ancient rivers and inland seas appear more rugged. Either which way, anyone could get lost with a camera in the Badlands for eternity and never run out of cool things to shoot. 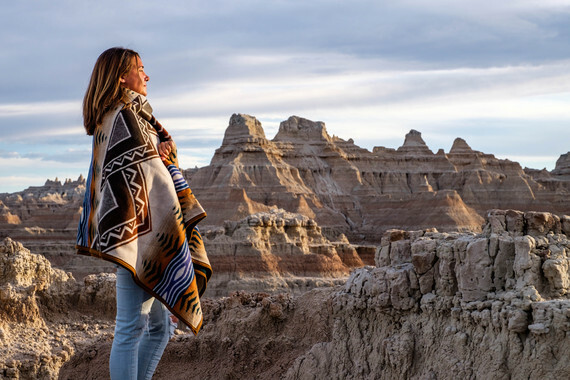 The Oglala Lakota Sioux Nation is the second-largest American Indian Reservation in the country with approximately 60,000 people from nine different tribes living on the Pine Ridge Reservation bordering the south side of the park. Their people have called the area home for more than 11,000 years; today, that same area is part of a treaty with the U.S. government for shared use of the land. Badlands National Monument (established in 1939) acquired 133,300 acres of Lakota land in 1976, two years before the monument was established as a national park. That land would become what is now known of the Stronghold District--a rugged and wild area of the park with few paved roads and thousands of years of history. For a better understanding of the Lakota heritage, we defer to the official site of the NPS at the White River Visitor Center. One thing we are equipped to share is where on the south side we found some cool scenes to photograph. Sheep Mountain Table is a well known sunset viewing location in the northern part of the south unit. If you have a little extra push in your tank, head down the highway to the southwestern edge of the park to the Red Shirt Table district for less-captured sunset photographs. Because the Stronghold District of the park contains an abundance of sacred and privately-owned lands, you will first want to discuss any plans you have to explore beyond your car with the White River Visitor Center. "My grandfather gazed down at me, and his words burned in my mind. He said back then, as today, the Lakota lived as one with nature. The land, sky, water, and the four-legged still are interconnected with the Lakota who are original members of the buffalo nation (Pte Oyate). Each and everyone is respected for their place in the web of life. Presiding over all is the Great Spirit. Our legacy, these truths that come from our oral tradition of storytelling are taught to the people of the world at this place. These ideas burned in their minds too, my grandfather said."